Images Copyright and Credit: Ari Friedlaender. 'Such incredibly dense numbers of whales and krill have never been seen before anywhere worldwide,' said marine biologist and co lead author of the study, Douglas Nowacek at Duke University, North Carolina. 'Though there were reports of large harvests of animals 100 years ago in the same area, five whales per square kilometre is huge. In the same area later in the year you would expect no more than one animal/km2,' he added. 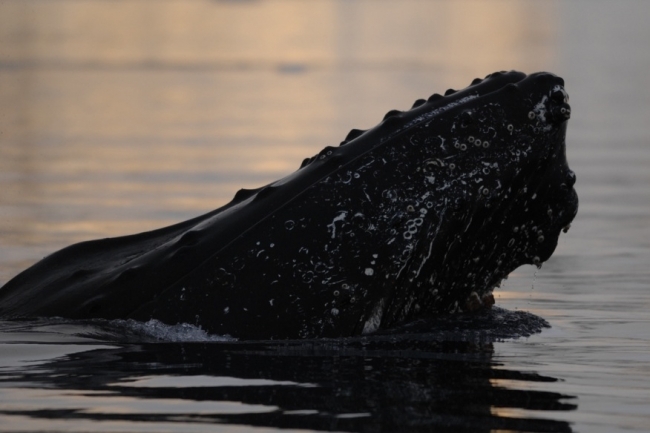 Such abundance might seem positive, and certainly is for the hungry humpbacks in the short term, but the underlying reasons for the events are climate change driven. The Antarctic ocean remains ice free for longer in the season and that is not good for either species in the long term. Previously, during the autumn, the whales had to migrate as the ice formed, protecting the krill that moved into the phytoplankton rich bays to feed in the winter. Almost all life in the Southern Ocean is ultimately dependent on the protein-rich crustaceans, from seabirds, seals and penguins, to the filter feeding whales. But the krill need the ice to feed on algae that live on its under surface during the winter. No ice, and a year's generation of krill disappear. Krill densities have been falling in tandem with ice cover and while whales can migrate to find food, populations of penguins and seals that cannot forage for great distances will be affected first. The study was published in the online journal PloS One today (April 27).